This leaflet - the printed equivalent of this web page - can be found in many local shops and public houses. Our footpaths and bridleways, which today are public rights of way, have been used by generations of local people going about their daily work. More recently they have become a source of pleasure to both local people and visitors, who enjoy walking in the beautiful Devon countryside, but please remember that though these paths and tracks are part of the public highway system, they are owned either by individuals or by organisations, and are generally on farmland. Owners are welcome to take dogs with them on walks, but the animals must be kept on a lead or under close control, especially in areas where farm animals are present. No special arrangements are made to enable pets to negotiate stiles or other natural features. Please stay on the marked paths, close and secure all gates behind you, keep away from cattle, crops and machinery, and take your litter home. Do take care of our paths, which are maintained both by Devon County Council and by a group of unpaid volunteers from the Parish. Enjoy your walk. This information offers the walker suggestions for a choice of walks of varying lengths in this Area of Outstanding Natural Beauty (AONB), using marked Footpaths (red) and Bridleways (green), over land once owned by Sir Francis Drake. Each Footpath or Bridleway is marked with the Footpath or Bridleway number, and these numbers are also shown on the map. 'Waymark Arrows' (yellow on a green background), are provided in suitable places to indicate the direction of the path. The walks start from the Yarcombe (Jubilee) Village Hall which is situated behind the Yarcombe Inn in the centre of the village about 60 yards from the A30 road. There is free parking here, although a donation to the Hall funds would be appreciated, for which purpose there is a letter-box slot in the Hall entrance door! We do ask that cars be left in that part of the car park behind the Hall, rather than in the front car park. (From the front car park, drive down the narrow access immediately to the right of the Hall entrance). You may of course start your walk at any convenient point, but please take care not to block narrow lanes or gateways if leaving vehicles other than at the Hall. Please do lock your vehicle and make sure valuables are kept out of sight. You may also wish to decide on a different walk yourself, using the map as a guide. Devon is geographically a county of hills and valleys, and several of the walks should be noted as 'steep in places', and thus are not suitable for those with a significant disability. It is strongly recommended that even the physically fit wear suitable footwear to cope with wet and sometimes muddy and uneven ground, and also take with them wind or shower-proof clothing, to ward off the cool breezes, when the weather is less clement. The magnificent panoramic views will reward your exertions. Distances and times shown are only approximate. There are no public toilets available, other than for customers at the Yarcombe Inn. Note however that the Yarcombe Inn is currently closed, having been acquired by potential developers. The building may not be immediately identifiable as the signs have been removed. 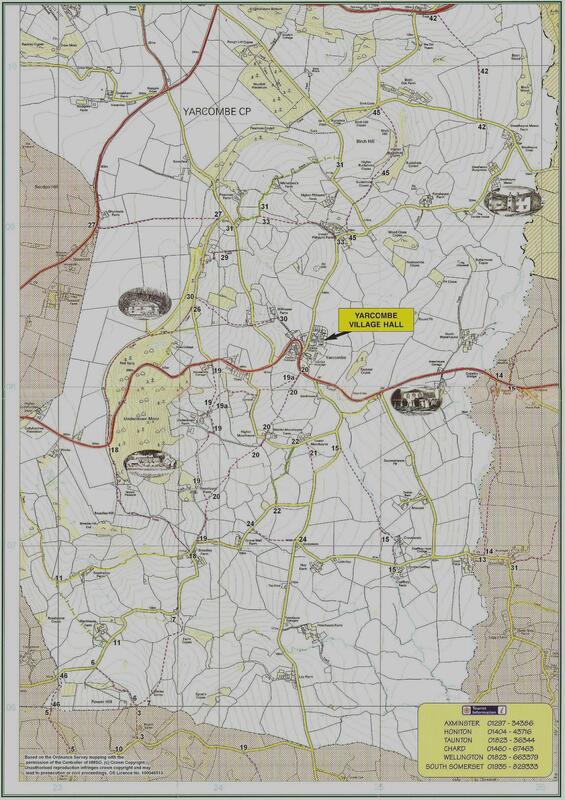 See the Save The Yarcombe Inn pages for progress on the campaign. An easy walk through open fields with valley views. About 3� miles or 1� hours. From the Hall car park, turn left and walk up to the A30 road. Turn left again and walk downhill past the Yarcombe Inn public house for about 100 yards, before turning right into a track at the start of Footpath 20. Cross the stile and follow the hedge line. Ignore the first stile on your left (which marks the continuance of Footpath 20), but continue following the hedge line, now on Footpath 19A, until reaching a wooden sleeper bridge. Cross the bridge and its associated stile and in front of you, across the field, you will see another stile leading onto Moorhayne Lane. Turn left down the lane then almost immediately right onto a narrow path just above the house known as Cornhill. Having crossed another stile, keep the hedge on your left and walk along the field. Go past the first gate on your left but go through the next, which is a few yards further on, and turn half left, heading downhill towards the farm buildings of Underdown Farm. This is the end of Footpath 19A and the start of Footpath 19. Go over a stile and turn sharp left, through a gate and over another stile into a field, leaving the garden hedge of the farm on your right. Go through the pedestrian gate at the bottom of the field and turn right onto the farm drive, and after about 30 yards, turn left and over another stile into a field. Follow the hedge for about 50 yards, to the corner, from where looking to your right, you will see a gate in the far corner which you should go through, and head towards the barn above you at Livenhayes Farm. Walk through the farm buildings and leave the yard by way of a further gate straight in front of you. Walk straight ahead down the field, through another gate and then turn half right, heading steeply uphill towards a stile, and the farm driveway. Turn left along the drive; go through the gates to the road and the end of Footpath 19. Turn sharp left down the lane towards Grove Well Farm. Leaving the buildings on your left continue for about 100 yards to the cottage known as Grovelands on your right. This marks the start of Footpath 24. Turn right, cross the stile and follow the hedge down the field to a pedestrian gate and stile. Walk ahead across the field towards Sunnyways bungalow on the far side. Cross the stile and the road to Stockland, and walk down the lane opposite past Hay Farm and Little Hay to Chaffhay Farm. On your left, immediately before the buildings is the start of Footpath 15. ***Go over the stile and cross the first field diagonally, to the far left corner. Walk into the copse and then follow the waymark arrows, keeping the stream on your right. Having crossed two bridges follow the stream until the large field narrows, when you will see a gate on your left - this exits onto the Stockland Road. Go through the gate and turn right, following the lane back onto the A30 road. Here, turn left and walk uphill back to the Yarcombe Inn and the Hall. ***Alternatively continue on past Chaffhay Farm to the top of the hill and turn left at the junction. You may then walk along the ridge road, admiring the views to each side, before reaching the Baptist Chapel on your left and the A30 road. Turn left and walk about 20 yards, before turning left again down a narrow lane which leaves the forecourt of the group of houses. This is Rag Lane and it will return you to the Stockland Road and the pub and Hall. A long gentle climb to a high point which gives commanding views of the Yarty Valley. About 3 miles, 1� hours. From the Hall car park turn right into the lane and walk away from the main road towards Lower Pithayne Farm. Ignore Footpath 33 at the bottom of the hill near the farm, but walk up to the tractor barn where opposite, at the top of some stone steps is the start of Footpath 45. Climb the stile here and follow the direction of the finger post across the field until you reach another stile which gives onto a lane. Cross both this stile and the one on the opposite side of the lane, and walk ahead across the meadow towards a gate on the far side, to the left of a copse. Having passed through the gate, walk diagonally uphill to another copse on the brow, and keeping this on your left, follow it round until reaching an open field. Leave the copse tangentially and walk forwards, down over the brow towards a gate which you will be able to then see, and the end of Footpath 45 at Birch Cross. Turn left here, walk up the lane towards the T-junction of Buckshots Cross and turn left again, up the steep hill and over the brow until reaching Bridleway 31 on your right hand side. Turn right into the field and walk straight ahead towards a gate on the far side of the field. Then follow the field boundary downhill, leaving the stone barn on your right, until you reach another gate leading onto a grassy track to Whitehorn's Farm on your left hand side. Then follow the house drive uphill passing the end of Footpath 33 on your left, until you reach the link road which joins the A30 road with the A303. From here you will have a magnificent view of the whole of the River Yarty valley. ***Turn left here and walk downhill to the A30. Take care in crossing the road at this point and continue downhill on the footpath until reaching the lay-by where you will find a seat, another splendid view and an Orientation Table showing the direction and distances to various local features. A further short downhill walk returns you to the lane leading back to the Village Hall. ***Alternatively, turn right uphill, take the first lane on the left and walk along the contour under the wood until you reach Footpath 30 on your left hand side. Cross the stile and follow the waymark arrows down through the wood to a gate at the lower right hand side. Walk straight ahead to another gate which can be seen opposite. Go through it, cross the link road, down the steep rutted track to the driveway of Hillhouse Farm. Turn right and follow the drive back to the A30, emerging just above the turn to the Village Hall. A walk across easy open fields and then a steep climb to Rower Tower and spectacular panoramic views. About 4 miles or 2 hours. From the Hall car park, turn left and walk up to the A30 road. Turn left again and walk downhill past the Yarcombe Inn public house for about 100 yards, before turning right into a track at the start of Footpath 20. Cross the stile and follow the hedge line to a stile on your left. Cross this stile and walking ahead and slightly to your right, head for a gate into another field. From here walk through another gate between the buildings known as Higher Moorhayne & Middle Moorhayne Farm. Cross the lane and walk straight ahead up the driveway opposite. In front of you is a stile. Cross this stile and walk diagonally right in the direction of the farm buildings which can be seen on the hill slope ahead. Cross another stile and follow the hedge line around to the left and go through the gate at the corner of the field. Ignoring the gate immediately on your left, follow the left hand hedge line, still walking gently uphill until reaching yet another gate. Go through this and then head diagonally right, steeply upwards to a stile, and exit onto the farm driveway and turn left. You are now on Footpath 19. Follow it through the gates to the road and the end of Footpath 19. Walk slightly uphill to Broadley Farm and turn left at the T-junction. Walk down the lane for about 400 yards until reaching a bungalow on the right hand side. Opposite is the start of Footpath 7. Walk down through the field to the stream at the bottom, and turn sharply right over the smaller concrete bridge into an ungated field. Walk up to the wire fence, go through a gate into another field and from there, looking ahead up the length of the field, you will be able to see a substantial barn known as Brimley Linhay. Heading towards this building, leave the field through another gate and then with the Linhay on your right, continue steeply up the hill through another gate to the top left hand corner of this field. Here the route divides, but we shall turn right onto a grassy track, leaving Footpath 7 and continuing on to Footpath 6. There is a splendid view from this point. The grassy track marks the start of Footpath 6 which travels along a contour of Rower Hill beneath Rower Tower, a local landmark. Follow the path, past the pond, eventually descending towards a field gate. By passing through the gate and walking downhill, keeping the hedge line on your right, you will emerge onto a surfaced road, and will have reached the end of Footpath 6. Turn right towards Blackhayes Farm, and the start of Bridleway 11. Go into the farmyard, (ignoring the drive to the house) and passing the duck pond on your right, leave the farmyard by way of a gate and walk straight ahead across the field, passing through two further gates, climbing towards the minor road near Rosshayne Farm, and the end of Bridleway 11. Turn right and follow the road back past Broadley Farm to Footpath 19, from where you may retrace your steps to the Hall. A steep climb then a walk along a wooded ridge to panoramic views of the Yarty Valley. About 3 miles or 1� hours. Turn left out of the Hall car park and walk up to, and cross the main road, (care needed) on to the pavement. Continue up the hill around the sharp left hand bend to the lay-by. Here there is a splendid view of the whole of the Yarty Valley, and an orientation table identifying local landmarks. ***From here continue up the hill a little way, before crossing the road (care needed) into the link road (signed to Taunton) which joins the A30 with the A303. Walk uphill until reaching the first house on the left, known as Winnowing Knapp, and a Footpath 30 sign on your left. ***Alternatively, from the lay-by, retrace your steps to the sharp bend and cross the road (care needed) into the cul-de-sac lane, following the Footpath direction sign to the driveway entrance of Hillhouse Farm. Here turn sharply left onto Footpath 30, up the steep and rutted path to the link road. If you have come from Hillhouse Farm, cross the road, or if you have come from the A30, turn left and go through the gate into a field. Following the footpath waymark arrow walk straight ahead, across the field, through a second gate into a copse. Follow the path diagonally right, looking out for further waymark arrows as you go through the cleared shrubs up to the top right hand corner of the copse. The stile here marks the end of Footpath 30. Turn left onto the surfaced road, known as Beacon Lane, and after about 60 yards fork right, through another field gate onto Footpath 26. You are now at the start of Footpath 18, so continue through the gate and the trees to a further gate into a field, ignoring a private track which leads down to the left. As you negotiate the gate, take a moment to admire the remarkable view down the Yarty valley towards the sea. Follow the track downhill, go through another gate and continue down to the surfaced road at Broadley Farm, which marks the end of Footpath 18. Turn left down the lane, leaving Broadley Farm on your right and after about 100 yards where the road turns sharply right and descends, fork left and go through the gate onto a track. This is the start of Footpath 19. After about 200 yards turn right off the track over a stile and walk diagonally left, towards and through the gate onto Footpath 20. Then turn diagonally right towards the farther of two gates at the bottom of the field. Go through the second gate and follow the right hand hedge about 50 yards to a corner, before turning half right again, from where you will be able to see a stile and the church and village in the distance. Cross the stile and head towards the houses, over another stile, before emerging into a lane at a point where the path passes between two houses, Higher and Middle Moorhayne Farm. Pass between the houses and through a gate into a field, follow the hedge on your right for about 50 yards, then go through another nearby gate which you will see in front of you. From here head for the church tower which is just visible on the skyline. After crossing a further stile, follow the hedge on your right to the final stile to emerge onto the A30 trunk road. Turn left up the pavement back towards the Yarcombe Inn and the car park. This information has been produced with the encouragement and support of Devon County Council and Yarcombe Parish Council, under the Parish Paths Partnership (P3) scheme.